YOU GET TO BE A TRAA MEMBER FOR A WHOLE YEAR FOR ONLY $25.00 Your membership also adds another voice to our efforts in protecting and enhancing aquatic habitats in the London & area community. YOU'VE TAKEN A LOT OF ENJOYMENT FROM THIS UNIQUE FISHERY. IT'S TIME TO GIVE BACK BY BEING PART OF THE SOLUTION. and other important TRAA activities. 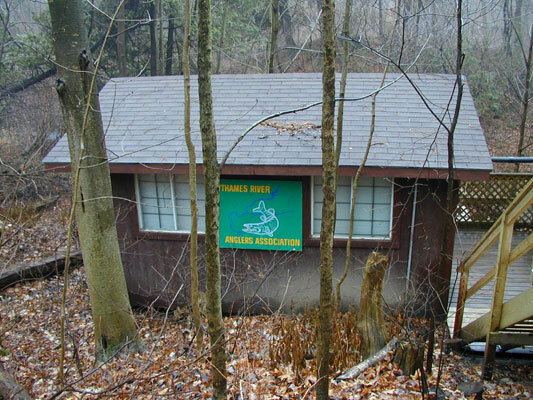 The TRAA Trout Hatchery began in the mid-1980's as an outdoor upwelling box located adjacent to Komoka Creek on private property. While it was a simple and rustic affair, the TRAA enjoyed incredible egg hatching and fry survivability rates for several seasons. 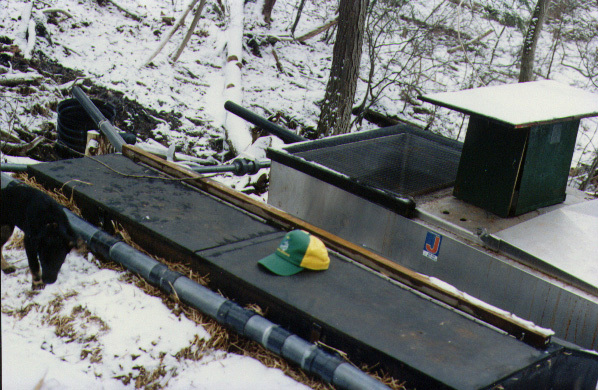 The picture on the left shows the front of the upwelling box with the individual outlets for each segregated cell emptying into a trough running along the front of the box. The shot on the right shows the back of the upwelling box with the spring source supply pipe feeding each separate valve for every cell. 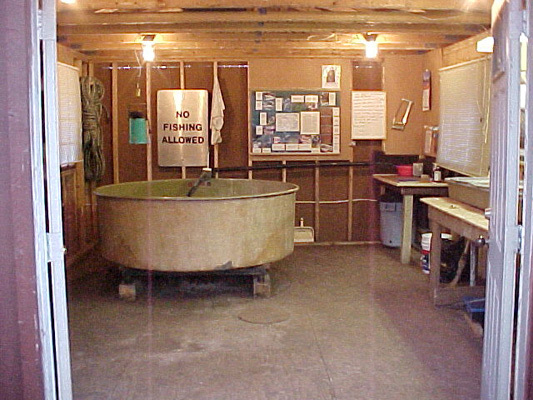 The stainless steel tank in the background was re-purposed from a milking operation into a fry holding tank.The box on the top of the tank housed the automatic feeder. While this setup served us well it was also very challenging to maintain. We had to pack the upwelling box with straw bales (see picture above right) to keep the water in the cells from freezing. 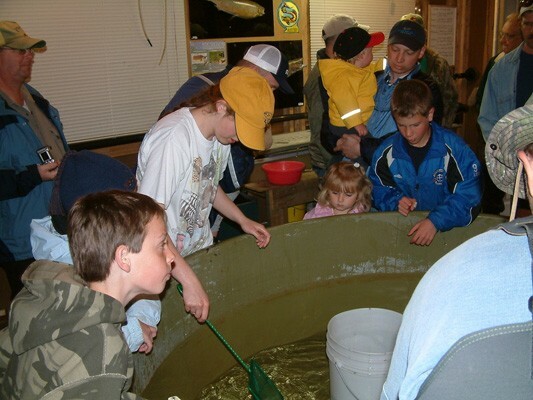 Members of the Trout Hatchery Rotation had to huddle over each cell picking eggs in wind-driven rain, sleet and snow. Something had to be done so a new setup was housed in a new enclosure. 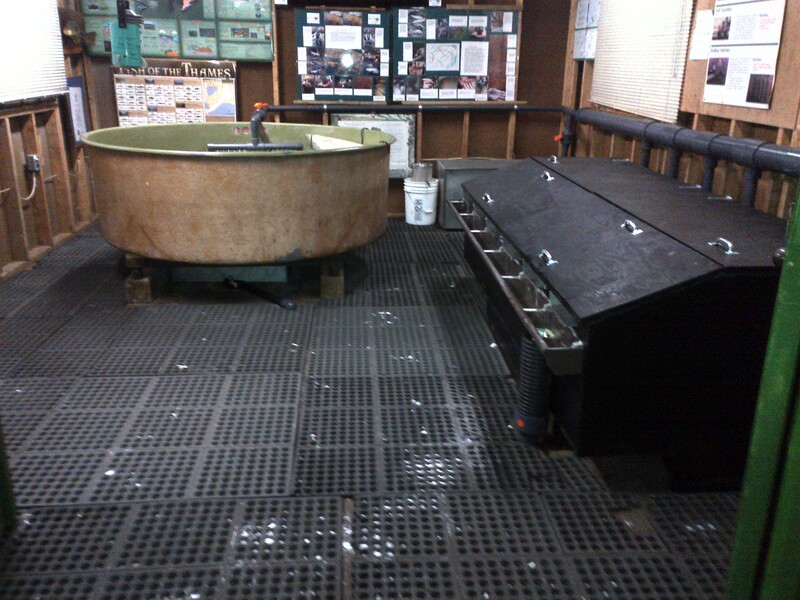 This facility consisted of a hatching trough with trays, a stainless steel fry box and a 6-foot diameter growth tank. The tray-style of egg incubation in the picture on the left was used for many years after the enclosure was built. It had its faults but as you can see, the comfort level for the egg pickers was beyond compare. 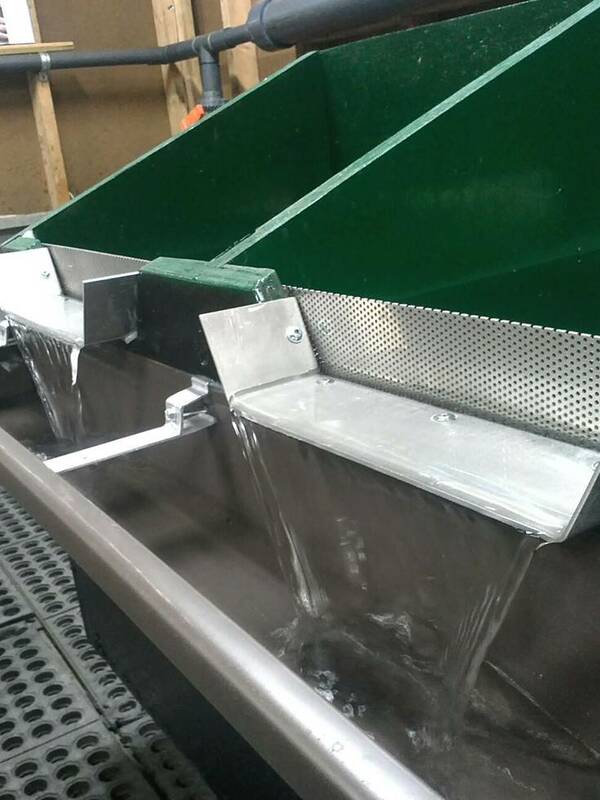 of TRAA design and manufacture and outperforms any of the commercial feeders we encountered. 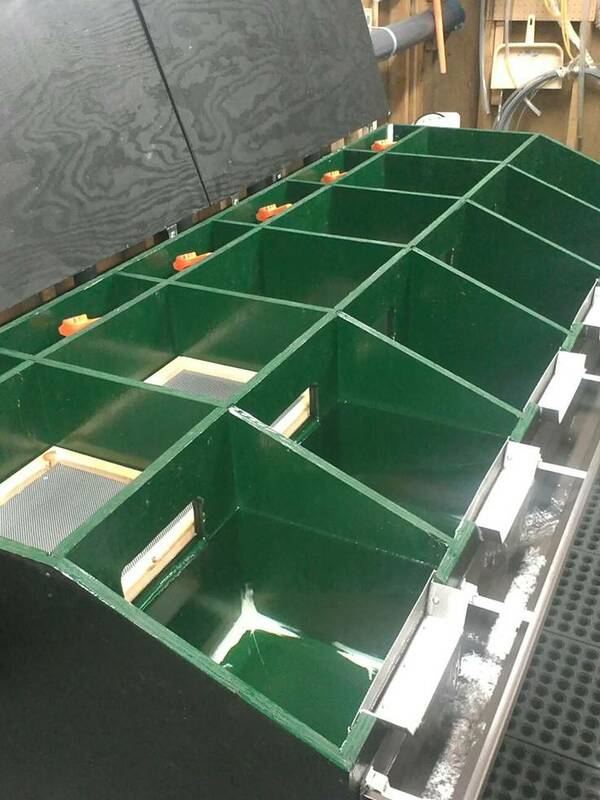 In the fall of 2012 we retro-fitted the old fry box into a single-cell fry box for brook trout eggs. 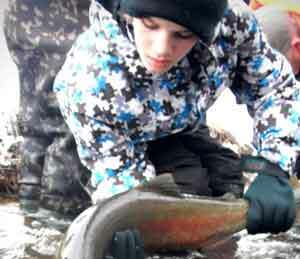 Click Here for more information on the brook trout project. 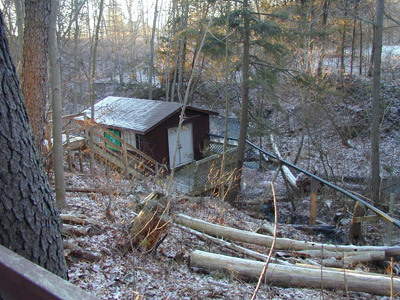 The water source originates from an underground spring uphill from the hatchery. The water is collected in an above-ground horizontal cistern that feeds a 4-inch source pipe. The head pressure created by the elevation drop provides all the water required without dependence on pumps and power. Always looking to improve, the TRAA Tout Committee began looking at ways to emulate the success we had with the upwelling box when it was outside. To that end we had a new one constructed by the carpentry class at H.B. Beal Secondary School and they did a great job! The pictures above show the box in its "raw" form on the shop floor at H.B. Beal Secondary School. It was constructed of marine plywood and ingeniously fastened together for strength. 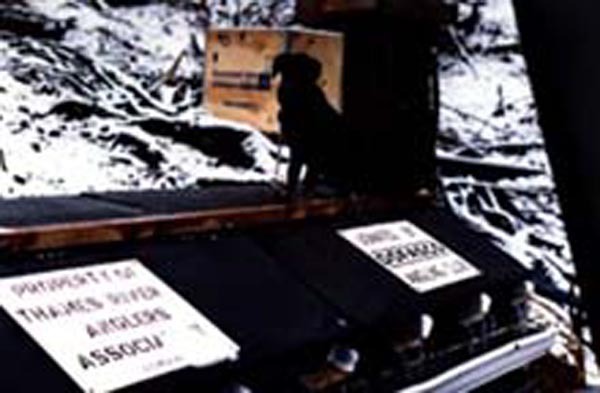 In the summer of 2013 TRAA members trucked it out to the hatchery site and wrestled it down the several flights of stairs to the enclosure. It was then painted and assembled, fitted with its plumbing and drains, caulked and tested then caulked again. This is the new upwelling box as it sits in its first year of service. There are six cells, each completely segregated from the rest. 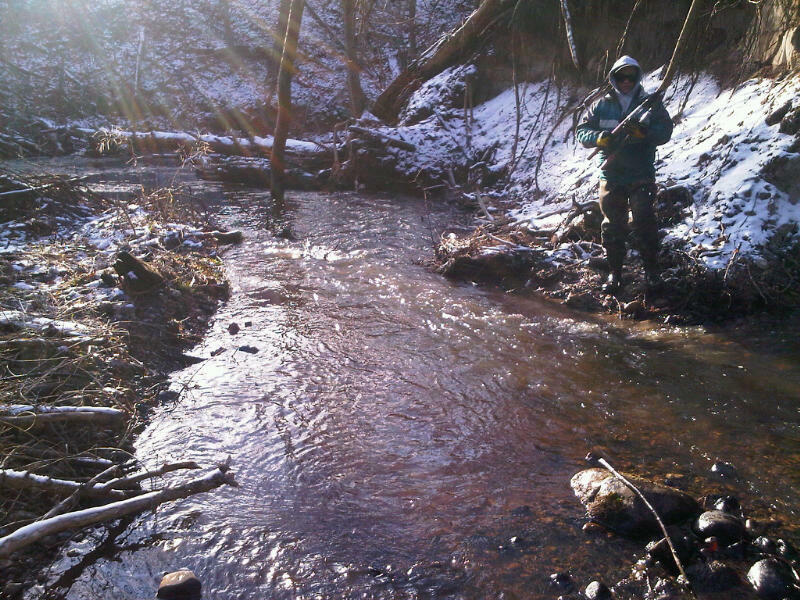 This will allow us to incubate one, two or even three species of trout at once! The two panels at the back with the single handles are hinged to be easily swung up so that the egg trays can be maintained. Once the eggs hatch the trays are removed and the fry begin consuming their egg sacs. Once they've used up their egg sacs they begin to move around actively. This is called the "swim-up" stage and they drift into the front array of their cells. The top panels with the double handles lift right off for access to the front array of the cells where the newly hatched fry will end up once they've reached the "swim-up" stage. The picture on the left shows the upwelling box with the front panels removed and the hinged panels swung up to reveal the screened egg trays. 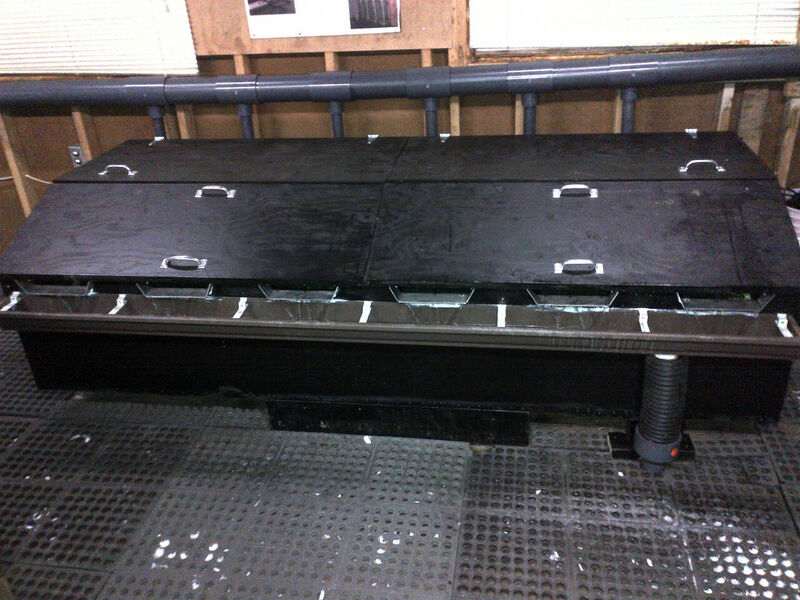 The water flows up from below the trays (this is the "upwelling" action from which the box gets its name), over the baffles and into the front array of the cells. Not only does this emulate a natural underwater spring, it also has the added benefit of being virtually self-cleaning! The picture on the right shows the outflow of each cell. Note the screens are in place to prevent the escape of fry after they reach the "swim-up" stage. Here's the new hatchery layout already to go. 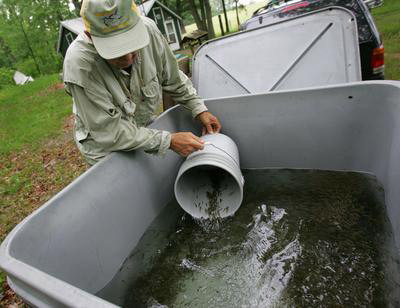 Currently we hatch both brown trout and brook trout together in the fall through to spring. While the browns are growing in the large circular tank, the brook trout will be in the stainless steel rectangular tank you can see on the right along the back wall. 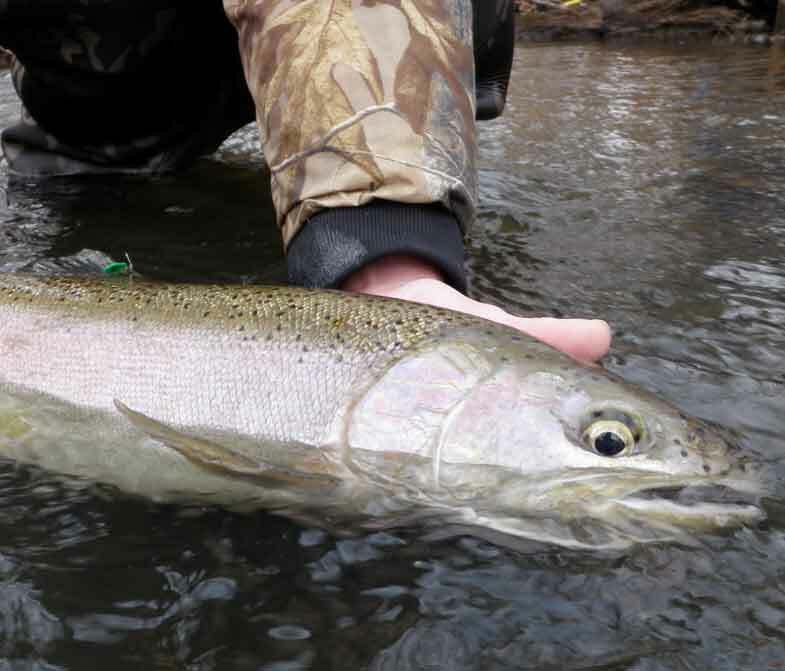 Rainbow trout eggs are introduced to the upwelling box n the early spring when the browns and brookies are still in the tanks. They will be released before the rainbows are ready to be transferred to the circular growth tank. Note the same green automatic feeder we've always employed. Some things you just can't improve! 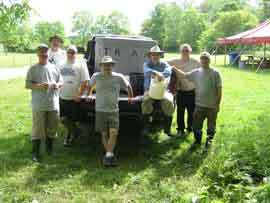 One of the most important mandates of the TRAA Trout Hatchery is the conducting of regular tours. Those in attendance are treated to the stages in a trout's life cycle that cannot normally be witnessed. If you and/or your group are interested in a tour, please contact us. 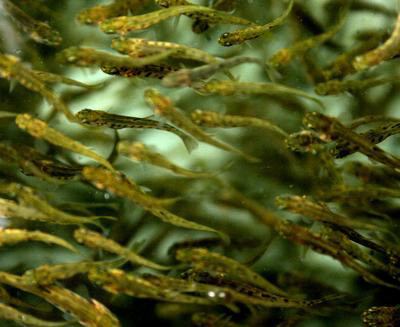 Once the rout fry have reached the stage where they are ready to be released, they are collected to be transported to their new home. The TRAA transfer tank is only a temporary home for these trout fry. 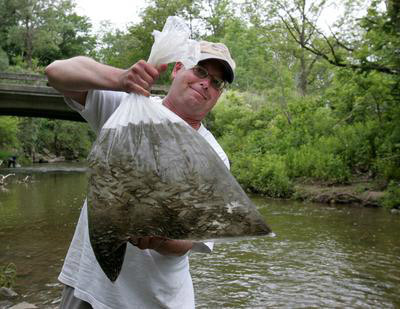 This is the first of many bags of trout fry ready to be release into a suitable tributary of the Thames River. 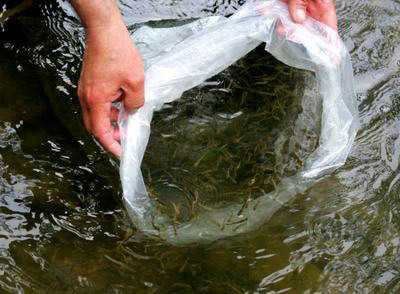 After the water temperature in the bags has been closely acclimated to that of the stream, the trout fry are carefully released into their new environs.